GIFT: A Bell of Hope was given by sister church St Mary-le-Bow in London. STRIPS of paper hang from the fences and walls of St. Paul's Chapel in downtown Manhattan. They carry poignant 9/11 messages of sympathy and encouragement to New Yorkers. The iron fence around the chapel, like the one at Union Square farther uptown, have become spontaneous memorials. As people visit, makeshift shrines inside and outside St. Paul's Chapel bring tears, prayers and stunned silence. The chapel, at Broadway and Fulton Street, just across the street from Ground Zero, came to symbolise the spirit of New York after the terrible September 11, 2001, attack on the World Trade Centre's twin towers. Amazingly, the chapel escaped undamaged when buildings around it came crashing down. Because it was so close to Ground Zero, St. Paul's played a vital role. It became not only the spiritual home for Ground Zero workers but also an extraordinary and unlikely round-the-clock relief centre for recovery workers. It was a place to rest up and grab some sleep, food and encouragement. Many thousands of volunteers worked in 12-hour shifts at the chapel to provide solace, comfort and care for the 2000 Ground Zero workers each day for months. Through St. Paul's doors came firefighters, construction workers, police officers and others for meals, beds, counselling and prayer. Medical personnel, massage therapists, chiropractors, podiatrists, and even musicians transformed the chapel into a place of peace, rest, and reconciliation. Medical workers even used the pew where the first American president George Washington prayed at a surgical table to patch and stitch tired and inured feet. An officer of the New York Police Department said at the time: "St Paul's Chapel is an oasis of Heaven in the midst of Hell." The chapel is now on a must-see list for visitors to New York. The wounds of 9/11 are never far from the surface in New York but until the official memorial is fully open and a museum is built, the chapel will remain in focus. Opened in 1766, St. Paul's Chapel is Manhattan's oldest public building still in continuous use and the only colonial-era church remaining in the borough. It has survived two New York disasters - first the Great Fire of 1776 and then the attacks on the World Trade Centre in 2001. The 1776 fire destroyed more than 500 buildings in Manhattan, including the chapel's mother church, the Episcopal parish of Trinity Church. Its remarkable survival has earned it the title of "the little chapel that stood". Walking through the chapel after 9/11 you were likely to see any number of things hanging on the pews or sitting on the floor - firemen's coats, helmets and hard hats; bandanas, work gloves and boots - all shed by Ground Zero workers while they grabbed some food and rest. At first it was strange to see these items in a church but soon it became commonplace. The chapel continues to witness the tragedy. A fireman's helmet now sits in a chapel display. It bears the number 343 - the number of firemen who died on September 11, 2001. Nearby is a table covered in photos of other people who died and used by family members to try to find their loved ones. A firemen's protective suit, dirtied and torn, adds to the dramatic display. A banner still hangs inside the chapel. It says: "To New York City and all the rescuers, keep your spirits up … Oklahoma loves you." An estimated one million people visit annually to learn about the ministry that took place at the chapel. Photos, cards, drawings, banners, flags, and other items sent to encourage rescue workers or as memorials, can still be seen. Most of the pews have now been removed to keep an open space for displays - and for worship. Walls and remaining pews are still scarred where workers, in their work gear and equipment, rested against them. Alongside St. Paul's Chapel is a churchyard with unique gravestones and memorials, some from the Revolutionary War. A Bell of Hope, given as a gift by its sister church St. Mary-le-Bow in London in September, 2002, to commemorate 9/11 and the chapel's mission work, stands outside the chapel's main door. 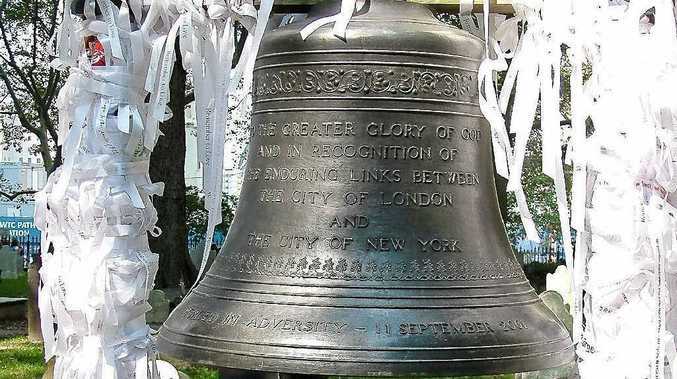 It is rung every year on September 11 in memory of the victims. In a nearby street, the wire fence is plastered with cards from well-wishers around the world. New York City has established a 9/11 Memorial Preview site in Vesey Street, across from St John's Chapel. Until the official National September 11 Memorial & Museum is finished and opened this year, the preview site is displaying memorabilia. It is free and open daily. Guides at the Tribute Centre are intimately connected with the events of September 11. They are survivors, family members who lost loved ones, rescue workers, civilian volunteers, police, firefighters and Lower Manhattan residents and workers. Their stories give you an unparalleled chance to connect firsthand with history. Five galleries convey the tragedy and the passionate response from around the world. The displays include a scale model of the twin towers. Photos show sweeping panoramic views of the scene and a poignant film shows the heart-wrenching recovery work of the dedicated individuals who rushed to help and continued to work tirelessly for months. A collage of photos and symbolic objects, lovingly shared by families, pays tribute to the victims. The national memorial and museum will be in the heart of the new World Trade Centre which will be the tallest building in the USA. The memorial includes two massive pools set within the original footprints of the Twin Towers with 10-metre waterfalls cascading down their sides. The names of the 3000 men, women and children killed in the attacks in New York, at the Pentagon and in Pennsylvania, and in the 1993 World Trade Centre bombing, are inscribed in bronze around the edges of the waterfalls.